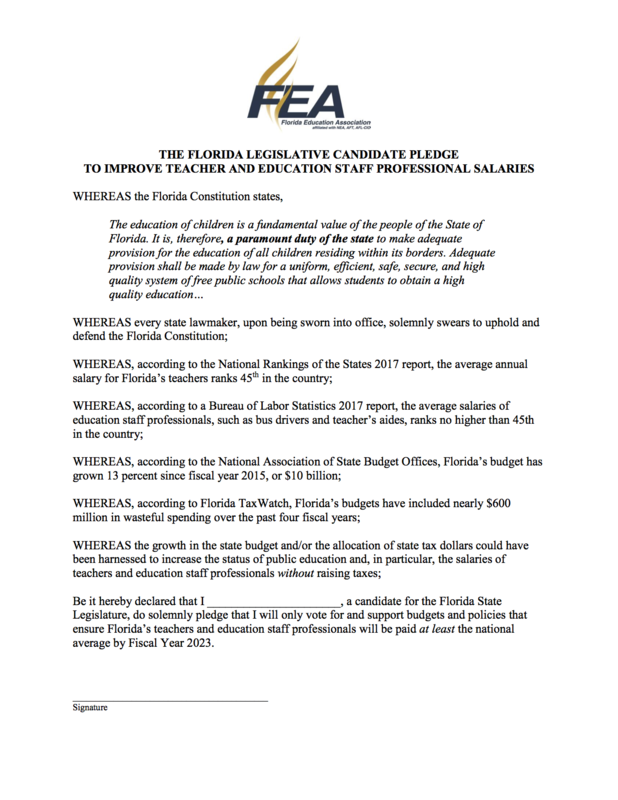 The Florida Education Association is asking all candidates for State House, State Senate, and Florida Governor to sign a pledge to only support state budgets that will raise teacher and education staff professional salaries to at least the national average by 2023. Why Should Candidates and Legislators Sign the Salary Pledge? Florida’s public school teachers and education staff professionals sit near the bottom of the barrel nationally when it comes to pay, ranking at 45th or worse when compared to other states. Our kids deserve a great education, and well-qualified professional educators are the very foundation of the “high quality system of free public schools” mandated by the state Constitution. Right now, Florida’s public schools have a tough time finding and keeping enough qualified teachers. According to state records, 40 percent of new teachers here leave the classroom within their first five years in the profession, which is well above the national average. Pay is a big part of the problem. The average teacher salary in Florida is more than $12,000 less per year than the national average of $59,660. Average teacher pay here has actually gone backward in the past decade, decreasing by a whopping 12.2 percent in inflation-adjusted dollars from 2009 to 2018, as shown by statistics from the National Education Association. Lifting wages to at least the national average by Fiscal Year 2023 can be done by harnessing tax revenue growth, eliminating wasteful spending and shifting priorities for allocating funds. Which Candidates Support Increasing Educators’ Salaries? What is the average teacher salary in Florida? In 2017, the average annual salary of Florida’s teachers was $47,267—45th in the nation. What is the average teacher salary in the USA? The average annual salary of teachers throughout the country was $59,660 in 2017. This is more than $12,000 per year higher than the Florida average. What is the average education staff professional salary in Florida compared to the rest of the country? Education staff professionals, such as teacher’s aides and bus drivers, earn an average of less than $19,000 per year. According to national data from the Bureau of Labor Statistics, this ranks in the 10th percentile of salaries for these positions nationally. What is the average per pupil funding in Florida compared to the rest of the country? Florida’s public school revenue per student enrolled was $9,562 in 2017—44th in the country. The national average was $12,998 per student enrolled. How much have teacher’s salaries increased in recent years? Salaries have actually gone backward in the past decade. The average teacher salary in Florida decreased by a whopping 12.2 percent in inflation-adjusted dollars from 2009 to 2018, as shown by statistics from the National Education Association. What is the attrition rate for Florida teachers? State records show that 40% of new teachers in Florida leave the teaching profession within their first 5 years. This is 15-20% above the national average, depending on the year. How will we pay to bring teacher’s and ESP’s salaries to the national average? First and foremost, as we look to the future of our state, how could we afford not to? Aside from that, Florida Tax Watch has identified nearly $600 million in wasteful spending in the past four years. Also, the state has diverted hundreds of millions of dollars to vouchers for unaccountable private schools. If the legislature would earmark a percentage of the budget to increasing salaries and cut wasteful spending in half, those measures alone could close the gap by Fiscal Year 2023. Educators: Has your salary kept up with inflation? Founded in 1886, the Florida Education Association now represents 140,000 teachers, education staff professionals, higher education faculty, graduate assistants, education students and retired educators.